I am honored to be a speaker for the 2nd time this year at DevConnections, speaking at DevConnections Las Vegas October 31 to November 3rd. 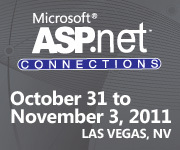 At this fall's conference, I will be presenting a lot of content on for ASP.NET developers on HTML5. A lot. Specifically, I'll be doing one full-day pre-con all about HTML5, CSS3, and related web technologies, and then two additional HTML5-focused sessions during the conference. If you're an ASP.NET developer looking for a way to quickly get started with HTML5, this is the perfect conference. If you are a ASP.NET developer ready to start really working with HTML5, this is a full-day pre-con you don't want to miss. I'll spend a day taking you from "What is HTML5?" to teaching you the essential ins and outs that will help you start adopting HTML5 immediately for website and app development, for both desktop browsers and devices. A full overview of the workshop is available on the DevConnections website. Unlike other conference sessions, you must register separately for the pre-con. So if you think the idea of Las Vegas + HTML5 + some really fun learning sounds like a good idea, be sure to include the pre-con in your registration! It'll be a great way to kick-off your week. Questions about what the workshop will cover? Feel free to contact me or ping me on Twitter (@toddanglin) and I'll be happy to help answer questions before and after the event. This is an intensely practical session. If HTML5 seems like a lot of hype to you, like something that's not ready for real world browser use, this is a must-see session. We'll examine the different strategies and techniques that the ASP.NET developer can employ to begin adopting HTML5 and CSS3 today while still maintaining broad browser compatibility. This session is full of practical tips and examples you can begin applying to any HTML5 work you're doing (or want to be doing) now. I love this session, and audiences that have attended this session in the past love it, too. LESS is a simple framework that extends the power of CSS to give the language all of the things we wish it had out of the box: variables, nested-rules, mix-ins, and even operations. The cool thing is that this is 100% usable today without an ounce of concern -- LESS outputs plain-old-CSS (POCSS). This is a huge timesaver for developers adopting CSS3 rules, and a great way to improve CSS maintainability. The session will also introduce ways to easily work with LESS in Visual Studio, as well as ways to quickly deploy in ASP.NET. You'll be disappointed if you skip this session. I promise. Microsoft is backing HTML5 with features in ASP.NET. Google is backing HTML5 with Chrome OS and the Google Web Store. Apple has always been a strong proponent of HTML5 (heck, they own html5.com). Facebook is rumored to be betting on HTML5 in a major way with a new app platform. And Amazon recently showed their faith in HTML5 by launching an HTML5-powered Kindle app and music service. The entire industry seems to understand the importance of HTML5. Do you? Don't get behind and attend my DevConnections HTML5 pre-con workshop and sessions this November!